This year’s Winter Carnival, called “Dartmouth College of Icecraft and Blizzardry: A Magical Winter Carnival,” is packed with Harry Potter-themed events. In addition to the traditional events such as the polar bear plunge, the human dogsled race, the ice sculpture contest and the 99-cent ski day, this year will also feature some new additions. The polar bear plunge and ice sculpture contest will kick off the weekend on Friday afternoon, followed by the human dog sled race and 99-cent ski day on Saturday. Similar to the past few years, there will be an opening celebration on Thursday featuring remarks from Dean of the College Rebecca Biron, the ski team skiing around the Green and an a capella show with the Subtleties. For the first time this year, there will be an opening celebration following the ceremony, Winter Carnival Council chair Audrey Scott ’19 said. The opening celebration will be held in Collis Common Ground and will feature Harry Potter-themed treats such as “golden snitch pops,” “butter beer” and “potions,” Scott said. Many of the other events will also tie into the Harry Potter theme, including an exhibition in Rauner Special Collections Library that will mimic the forbidden section of the Hogwarts library and an arts and crafts wand making projecton Saturday, Winter Carnival Council chair Eric Chen ’17 said. Harry Potter-themed posters, designed by Helena Eitel ’17, as well as long-sleeve t-shirts, designed by Alexis Wallace ’17, are being sold in Collis through Saturday. Another new addition to this year’s Winter Carnival is an ice skating rink on the Green — weather permitting — which will be used for activities organized for the house communities. These may include broom ball or ice-skating times designated for particular houses. Manager of Conferences and Events Jim Alberghini was involved in the construction of the ice rink and said he hopes to keep the rink open through next week. There will be open hours for anyone to come and skate. However, the warmer weather certainly poses concerns about the opening of the rink, Alberghini said. “We are going to have to see how the next three or four days go,” he said. This year’s snow sculpture was built on the Green by a group of students, alumni and faculty on a volunteer basis. The project was spearheaded by a group of students, led and organized by Mercedes de Guardiola ’17, and alumni passionate about the College’s Winter Carnival traditions. The Winter Carnival Council announced on Jan. 13 it would not be focusing efforts or funding on the snow sculpture. Due to limited guidelines issued by the College's Risk and Internal Controls Services and limited time, the dragon-shaped sculpture had to be under four feet in height. Additionally, the limited snow was another obstacle the team had to work around, the organizers said. Hanover community member Bill Young, along with several other community members and alumni, and Mike Gonnerman ’65, volunteered to aid in the funding and snow collection efforts. The volunteers brought the snow in from the Campion Skating Rink, the organizers said. Young has helped build the snow sculpture for the past 30 years and was happy to be able to help carry on the tradition this year, he said. After hearing that de Guardiola would be leading construction, he got in contact with her, Young added. Young, who knows people involved in trucking, said he was able to help transport the snow that de Guardiola had secured from the skating rink. There were also numerous other options for getting the snow, including making artificial snow, transporting it from the Dartmouth Skiway or waiting for the snow to fall. Gregory Partridge ’16 found out about the project through Cabin and Trail and said he was happy to help carry on the tradition. Partridge said he organized the undertaking with a few other student, and then 20 to 30 additional students assisted in the building process for varying amounts of time. The volunteer crew also encouraged passersby to join in, which proved to be more effective than the initial emails sent out requesting help, Partridge said. In terms of Collis’ decision to not officially fund the sculpture this year due to lack of student interest and snow, Partridge said he thinks the number of volunteers successfully demonstrated a high level of interest. 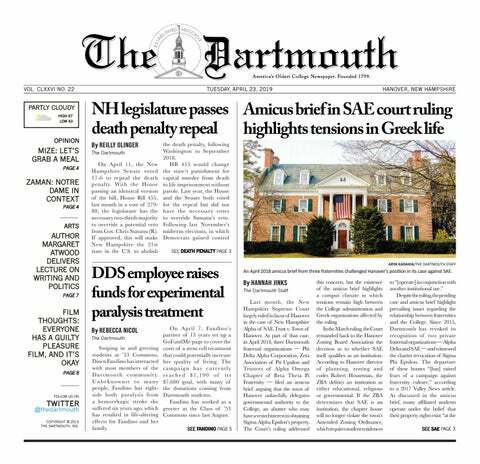 “They cited lack of student interest as one of the reasons, and I think we definitely proved them wrong,” Partridge said. After a total of about 10 hours of work on the construction, the completed dragon sculpture is now displayed on the Green. The previous version of this article stated that the sculpture height was limited to four feet due to town permit restrictions, when in fact this height limit was suggested by the College's Office of Risk and Internal Controls Services.